General references for materials used in Carton manufacture range from Boxboard, Cardboard, Carton board to Paperboard. In the Carton Industry it is commonly referred to as just “Board”. However, Board can come in different grades, calipers, and thickness. Listed below are references to a few of the more common grades used in the Folding Carton Industry. This grade is white bleached virgin fiber throughout, has a Clay Coated printing surface and is available in calipers ranging from .010” to .030”. The board is a favorite choice of Carton Converters because of its cleanliness, smoothness, and scoring & bending characteristics. The virgin fibers allows for greater strength in lower calipers. This board offers a lower cost alternative for a quality printed carton. It is a multilayer structure, produced using 100% Recycled Fiber and usually with a minimum of 30% Post Consumer Waste Paper, which complies with regulations in certain States. The caliper range for this grade runs from .016 to .036. It is widely used in the industry and is an environmentally friendly choice. It is also available in a Clay Coated Kraft Back for cartons requiring additional strength. This Coated board is produced using unbleached Kraft fiber, typically has high strength, especially in tear resistant strength. It can be modified with resins added during forming that impart wet strength characteristics for beverage and freezer packaging. Calipers range from .013 to .030. The virgin fibers allow for greater rigidity in the carton. Bending Chip: This category of URB provides bending qualities of 180 degrees and is used for unprinted and 1 to 2 color printed cartons with minimal graphics. Plain Chip: Typical uses are for flat non bending items such as pads, spacers, dividers and partitions. This is a natural Kraft fiber paperboard of height strength and light weight that offers high yields and increased bursting strength. It is available from only one Mill source and may only be ordered and produced based on their specific schedule dates. The caliper range is from .013 to .030. 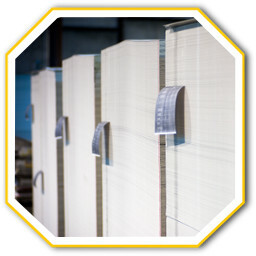 A bleached board produced using high pressure steam and mechanical refining process verses a chemical pulping process. Often used as an alternative to SBS. Currently available only from limited imported sources requiring truckload order quantities in calipers of .014 to .028. These grades provide degrees of protection from wicking of oils and grease. The barriers are created with special additions to the Coating and or to the Calendar Stack Solutions. They are used to package items that may have residual oils on their surface. The treatment prevents stains from migrating through the board to the printed surface. This is typical a Polyethylene film that is extruded or laminated to the board. The film can be of different thickness, but is generally .0025 to .0050. The film can provide moisture resistance as well as a grease & oil barrier. The manufacture requires a separate operation to apply the film to the board. Don't see the right material? We've only listed the most common. If you want to learn more about using a specialty material in your folding carton, send information using the Request a quote online, an e-mail to Sales@NationalCarton.com, or talk to a customer service representative Monday-Friday, 8 a.m. - 5 p.m. EST, by calling 1-800-800-6221 Ext 1.